What a busy week! Darren was gone for several days at a conference. Then I headed to Glasgow with some of the gals for a day out at the Country Christmas Faire. And to finish up the week, we had our AWF Thanksgiving Dinner on Saturday with great food, fun and fellowship. Now we have just 8 days until we leave for the States! And so much to do. 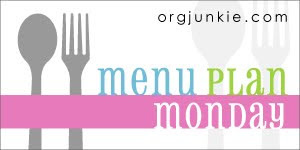 This week's menu is based on using up everything we can from the fridge and freezer.